My family and I lived in the St. Louis area (in Belleville, Illinois, on the east side of the Mississippi River) from 1991 through 1996. 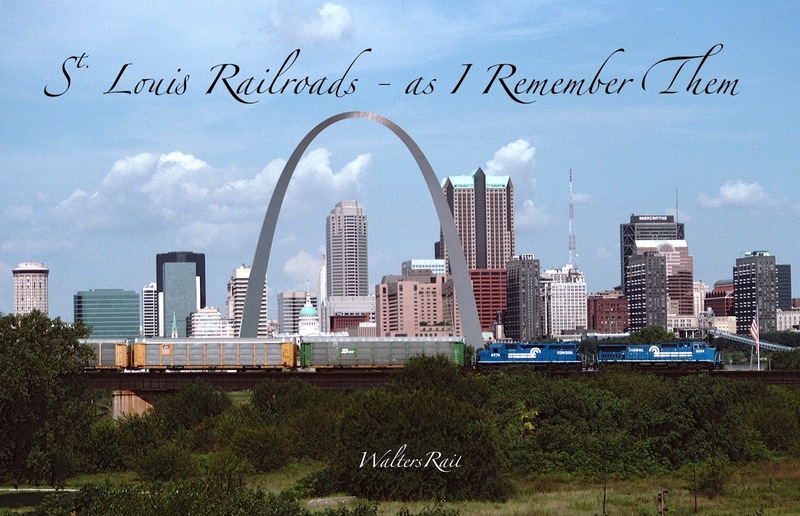 During those six years, I was able to photograph railroads all over the St. Louis metropolitan area -- and beyond. This post is a photo-essay of images taken within about a one hundred miles radius of downtown St. Louis. 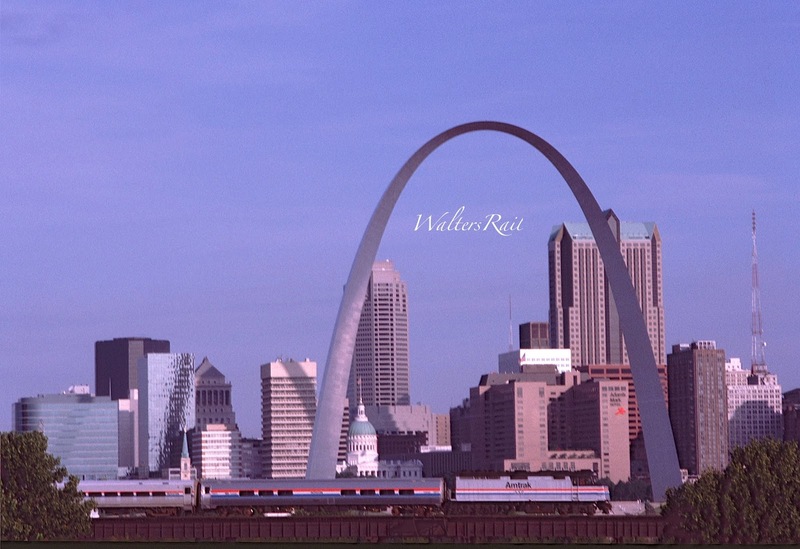 Although I left St. Louis twenty years ago, I still have fond memories of one of the most unique American cities -- one in which the French influence is muted but still present. This post does not purport to be a thorough survey of all the rail lines in and about St. Louis. Instead, it is a collage of photographs taken over six years, during good weather and bad, during sickness and health. I hope you find the images interesting. 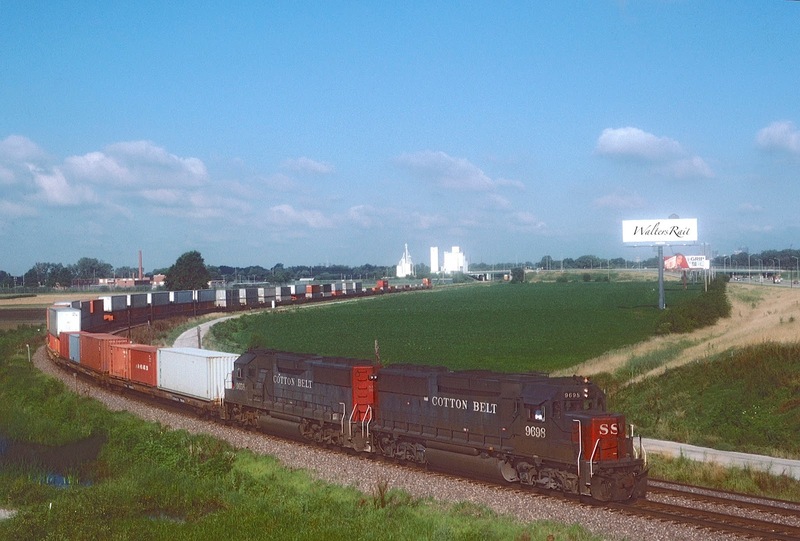 In 1996, an eastbound, loaded coal train comes off Burlington Northern's "K" line from Hannibal, Missouri, onto the elevated tracks of the TRRA (Terminal Railroad Association). 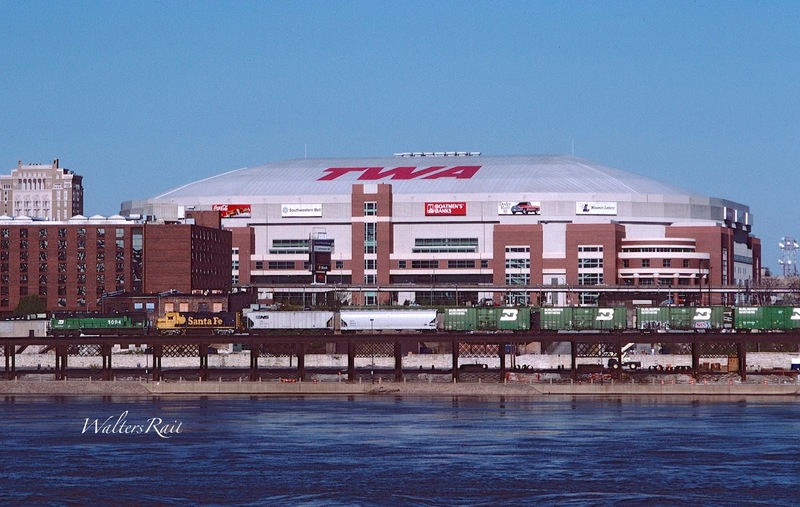 The train is passing what at the time was called the "TWA Dome," home of the then St. Louis Rams. The football team has now moved to Los Angeles, and the stadium is now called the "Edward Jones Dome," even though no team plays in it. BN 9532 East is approaching the Martin Luther King Bridge and soon will pass underneath the Gateway Arch. The Alton and Southern is the connecting (switching railroad) on the Illinois side of the Mississippi River. Most of the lines coming into St. Louis from Chicago (CSX and Union Pacific, for example) converge on the A&S. 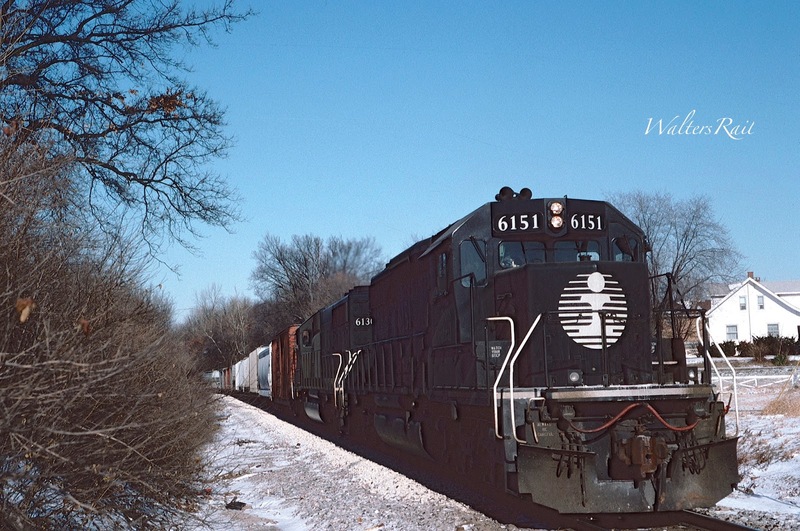 Here a short transfer freight rolls south toward East St. Louis, Illinois, on a pleasant winter's day. At the same location, a Union Pacific mixed freight passes CSX auto racks. St. Louis was the corporate headquarters of the Missouri Pacific (UP's predecessor in St. Louis), one of the region's major industries. Its iconic white office tower was an art-deco twin of the original Southwestern Bell Telephone Company fortress which stood across the street from the newer tower in which I worked for six years. 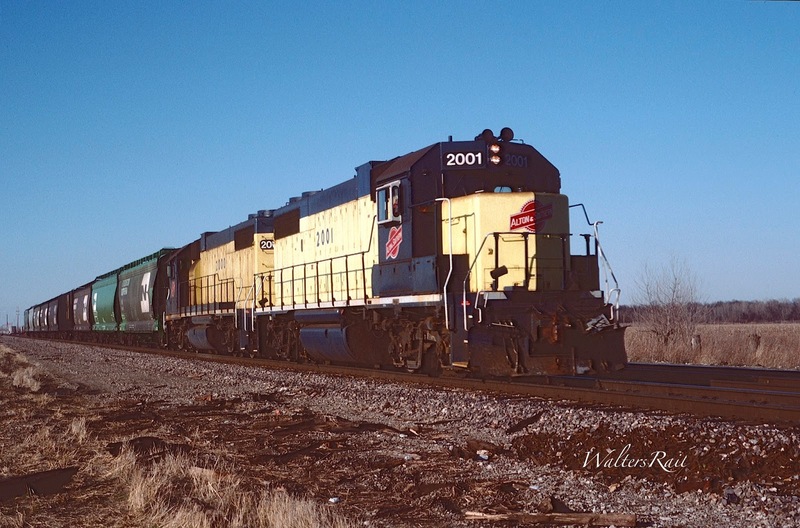 By the time I arrived, however, Union Pacific was running the show and had also taken over operations of the Missouri, Kansas and Texas Railroad, another long time St. Louis fixture. For six months, before my family could join me, I lived in a downtown apartment building next to a former Katy employee who daily bemoaned the fate of his beloved railroad. 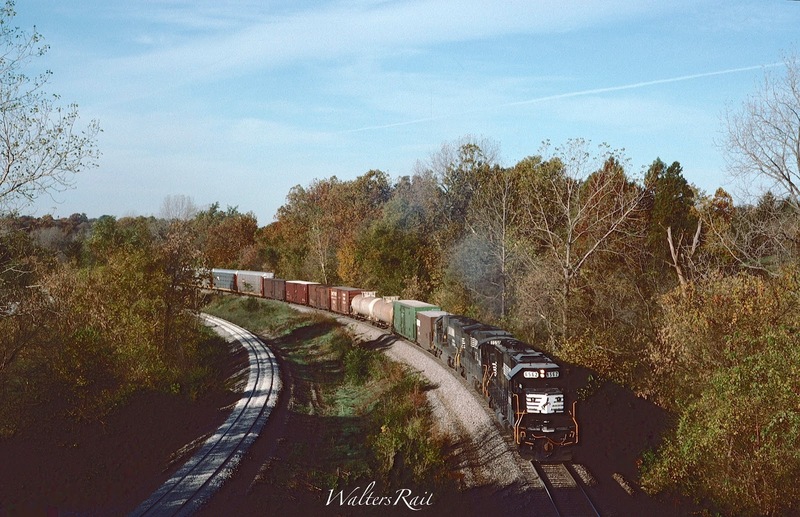 A Southern Pacific intermodal train negotiates the ninety degrees curve on the Alton and Southern out of East St. Louis. The train is preparing to cross beneath I-64, where the photographer is standing. This image was taken shortly before the Union Pacific purchased the Southern Pacific. This particular train is headed to Chicago on the line through Normal, Illinois, the same route taken by Amtrak from St. Louis to Chicago. My son went to primary school with a young man from East St. Louis who was extremely bright and went on to graduate from the University of Illinois. My son would often go to East St. Louis after school to play with his friend, and just as often his friend came to Bellville to play with my son. Both those "boys" are now over 30 years old. 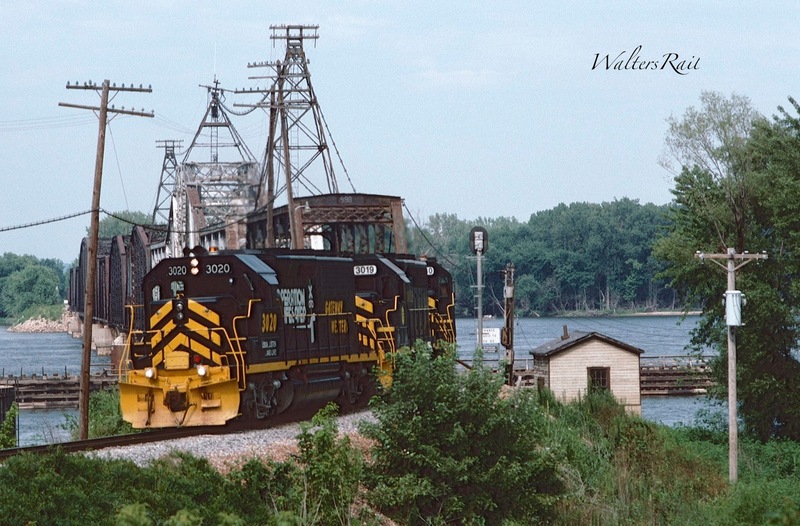 Here is a TRRA transfer freight on the east side of the Mississippi River. In the background are the King Bridge and the Gateway Arch. Immediately behind the engines is the Illinois flood wall. In the short time I lived in this area, the flood walls on both sides of the river saved metropolitan St. Louis from massive flooding and property loss. Considering that the walls were built in the early twentieth century, the engineering skill of long ago has been vindicated. 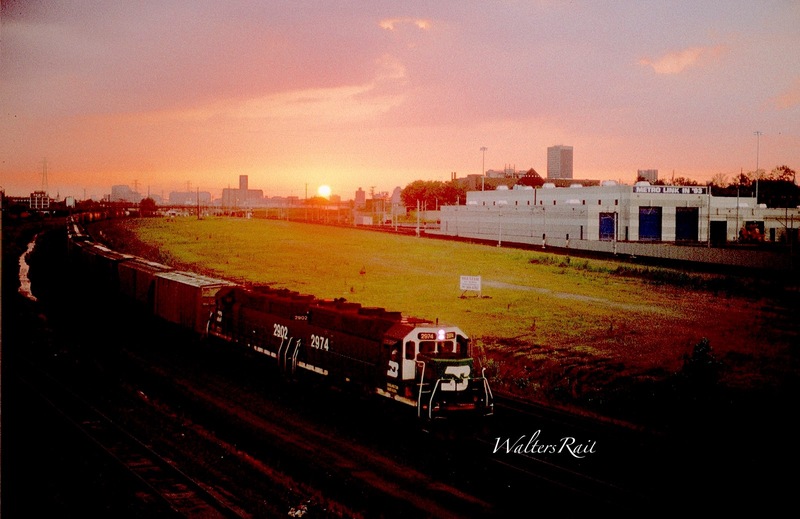 The Gateway Western was, perhaps, the most interesting railroad in the St. Louis area in the 1990's -- the remnants of the Gulf, Mobile and Ohio line from St. Louis to Kansas City. Originally, the GM&O line had come down from Chicago to Roodhouse, Illinois, about 60 miles north of St. Louis. The line then split -- one track running south to St. Louis, the other line running west to Kanas City. The Gateway Western only ran the line from St. Louis to Kansas City via Roodhouse -- an extremely circuitous route. I don't know if the line was ever profitable, but its motive power was always clean and photogenic. 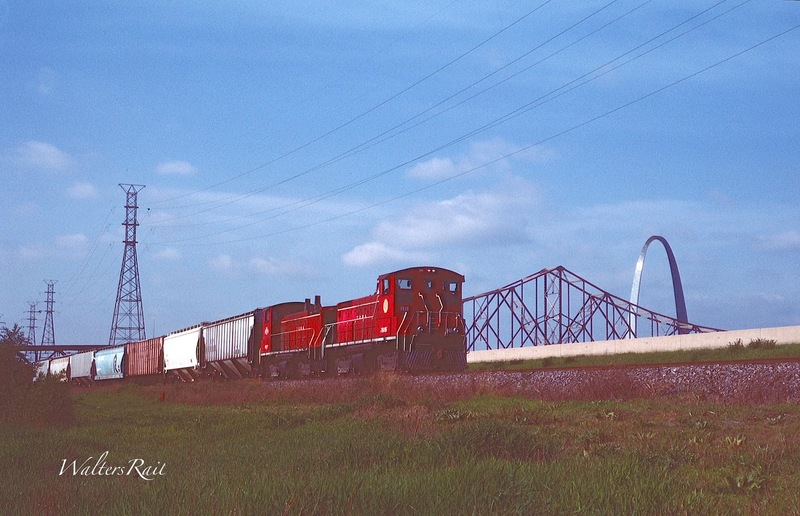 Above is an image of a Gateway Western freight pulling into the yard in East St. Louis, with the Gateway Arch visible across the river. The Gateway Western is now part of the Kansas City Southern. 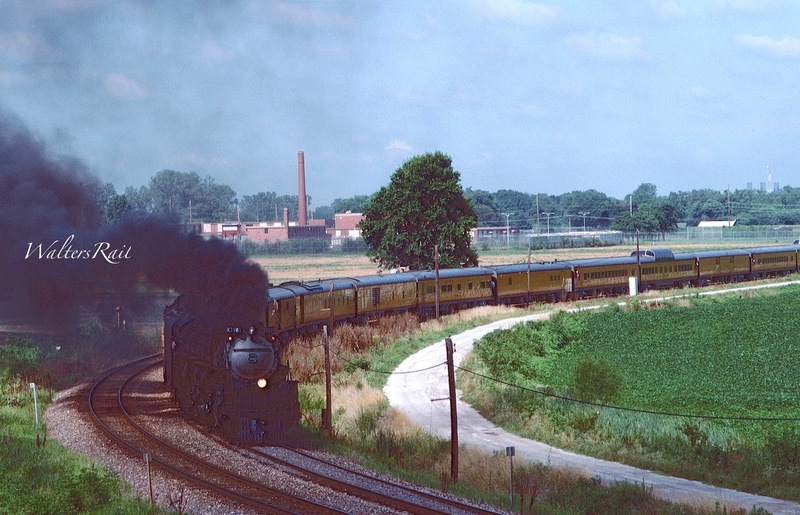 In the 1990's, the Illinois Central ran a branch line through Belleville to East St. Louis. 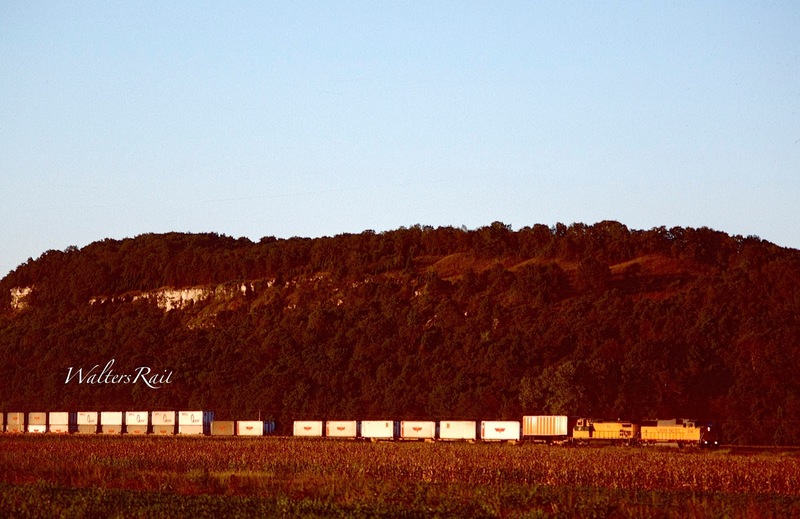 Above, the daily eastbound merchandise freight is leaving the yard and preparing to climb the grade out of the Mississippi River valley. 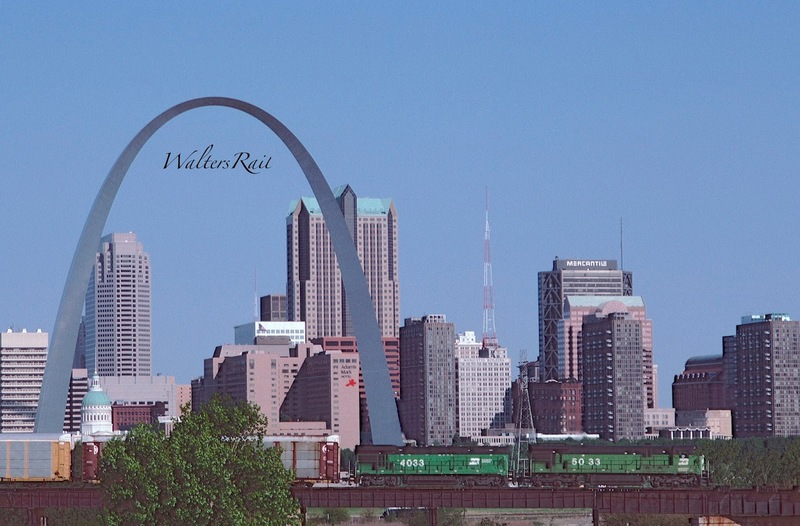 In the background is the St. Louis skyline and the Gateway Arch. Several of the crews on these freights were among the friendliest I have ever met. I would sometime chase an eastbound 15 or 20 miles past Belleville and then wait to meet a westbound. The crews would often climb down and chat with me. Most of them were nearing retirement and lived in Belleville. 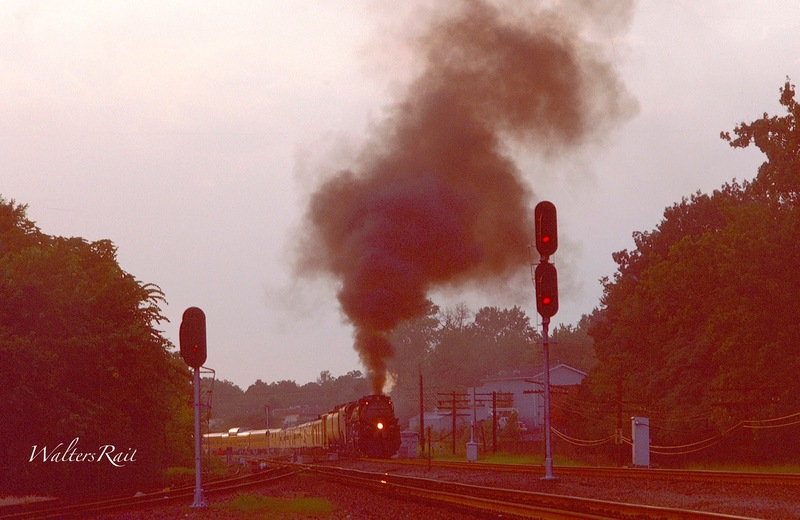 One crew even offered to let me ride with them to the junction with the mainline at Duquoin, Illinois. I declined, because my lawyer brain could not avoid thinking of what would happen if we were involved in an accident. 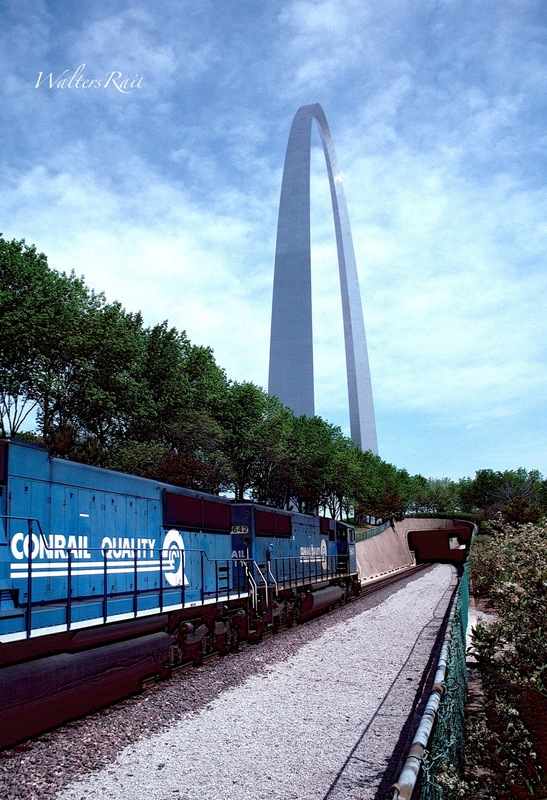 Here is a Conrail manifest on TRAA tracks entering one of the two short tunnels under the Gateway Arch. Photography here is extremely tight. This image was taken with a 28 mm lens. Few people realize that trains pass daily almost directly beneath the arch. Fewer still attempt photographs. In the several times I came to this location, I never saw another photographer. As you can see, the tunnel is wide enough for two tracks. I don't know if a second track ever existed. If so, I don't know when it was removed. This image was taken in July 1994. I have no idea what this location looks like today. A southbound BNSF manifest rolls past the TWA Dome shortly after the AT&SF and BN merger in 1995. During this transition, it was not uncommon to see motive power mixes like this on the K line. The photographer is standing atop the flood wall on the Illinois side of the Mississippi River. The image gives some indication of the strength of the current. A private ferry runs downriver from St. Louis at St. Genevieve, Missouri. Whenever I took the small boat across the river, the captain would approach the opposite shore at about a sixty degrees angle against the current. In that fashion the ferry would cross the river in more or less a straight line. Burlington Northern auto-racks are crossing TRRA elevated tracks on the east side of the Mississippi River. The office building in which I worked is framed under the left side of the Arch. In front of that building is the "Old Courthouse," which is now a museum. I have seen photographs taken as late as the 1960's in which the building was almost completely black from smoke and soot. The photographer is standing on the right-of-way of the elevated portion of Interstates 55 and 64. This section of road was patrolled regularly by Illinois troopers, so one was required to find a train, then race it to the elevated freeway, jump out, grab an image, then jump back in one's vehicle and drive quickly away. At least, that was the method I employed. Gateway Western 3020 West has crossed the Mississippi River and is heading for the diamond with the Burlington Northern K Line at Louisiana, Missouri. The swing span bridge -- the pivot of which is on the Missouri side -- opens frequently to allow barges to pass in both directions on the busy shipping channel. To see a grand overhead view of the bridge, use the following coordinates on Google Earth: 39.444353, -91034879. 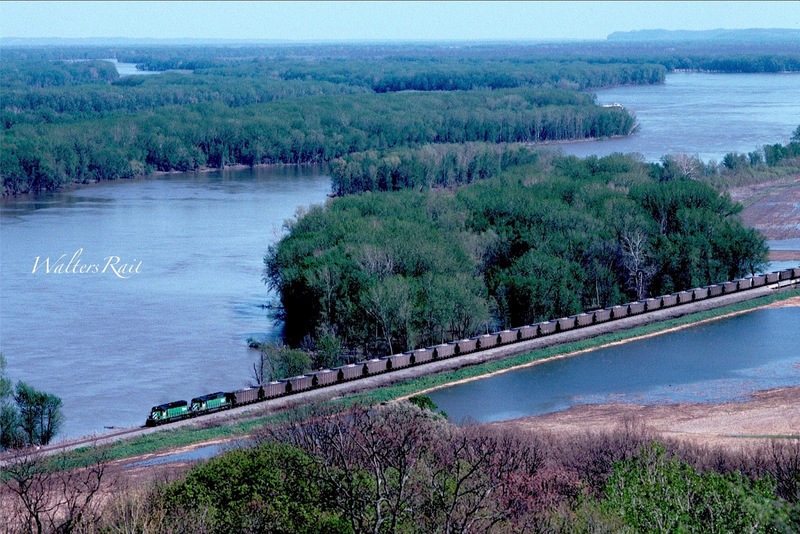 Louisiana, Missouri is a marvelous location for viewing trains along the big river. When I lived in the St. Louis area, the daily St. Louis to Chicago trains did not traverse this section of the TRRA. On this morning, however, heavy flooding downriver had closed the line to Arkansas and Texas, so the Eagle ran a short section north across the elevated TRRA -- after picking up passengers bussed from Little Rock. This was the only time I photographed Amtrak on this line. 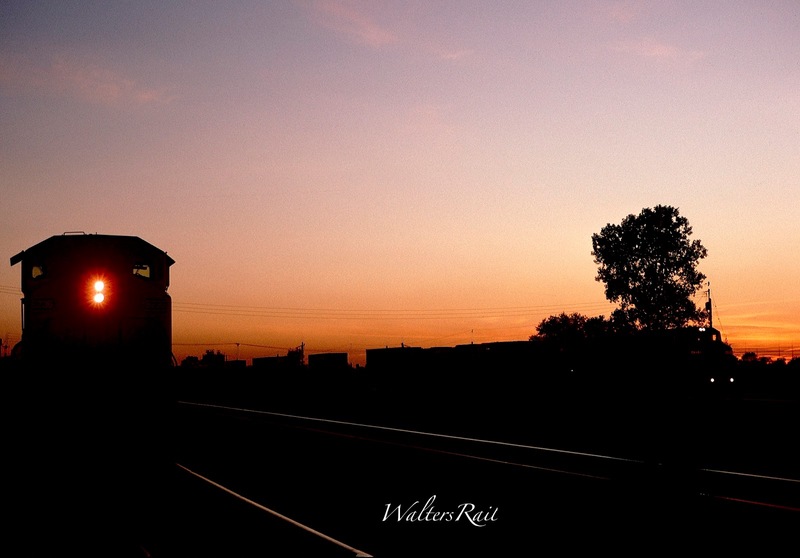 During my six years in this area, flooding on the Mississippi was frequent and spectacular, creating some amazing railroad images, a few of which I was fortunate enough to capture. 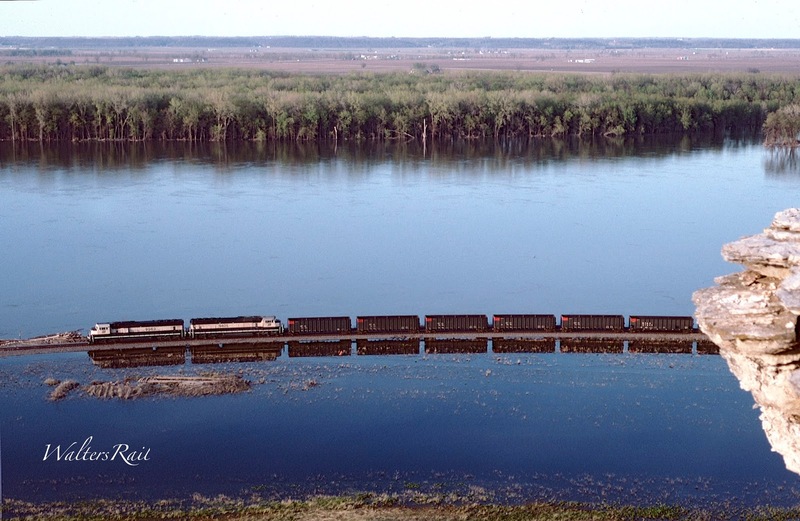 Here is a northbound empty coal train on the K Line, creeping through floodwaters toward Hannibal, Missouri. The Mississippi had been flooding for weeks and had almost breached the flood wall in St. Louis. At lunch, I would walk to the Gateway Arch and watch the incredible amount of water racing past. At various times, I saw wrecked boats, houses, dead cattle, refrigerators and hundred of trees floating downstream. 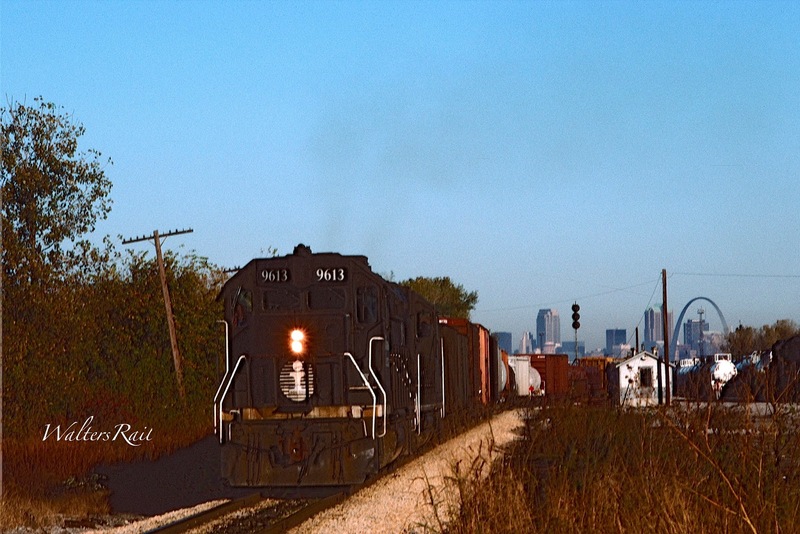 Somehow, the K Line remained open, and I took this image from a Hannibal city park. I climbed a small fence to reach the edge of the bluffs and was soon stopped by a local policeman who told me that about three weeks previously, a man had committed suicide, jumping off the limestone cliffs. I assured him I was not going to commit suicide and he good-naturedly allowed me to stay as long as I wanted. I can attest, from personal experience, that the officers in St. Louis are not as friendly. Here is a loaded coal train at the same location on the same day. Trains were literally creeping through this area -- no more than five miles per hour. To the right of the image lay several more miles of track inches above the flood waters. It is about 100 miles from Hannibal to St. Louis. It must have taken these trains many hours to travel that distance. It occurs to me that some crews might have gone "on the law" in the middle of the flood. I wonder if replacement crews came in by boat. Here are more flood waters downriver. Some of the worse flooding has begun to recede. The photographer has climbed to the top of a tree-covered hill to find this vantage point. I was chasing this train from St. Louis and was given a ticket in a "speed trap" in some little burg along the Mississippi River. I no longer remember the name of the town. Once the train reached the flood waters, it slowed to a crawl, so I was able to take this image even after my run-in with the local authorities. A northbound Union Pacific merchandise freight rolls slowly through Chester, Illinois. 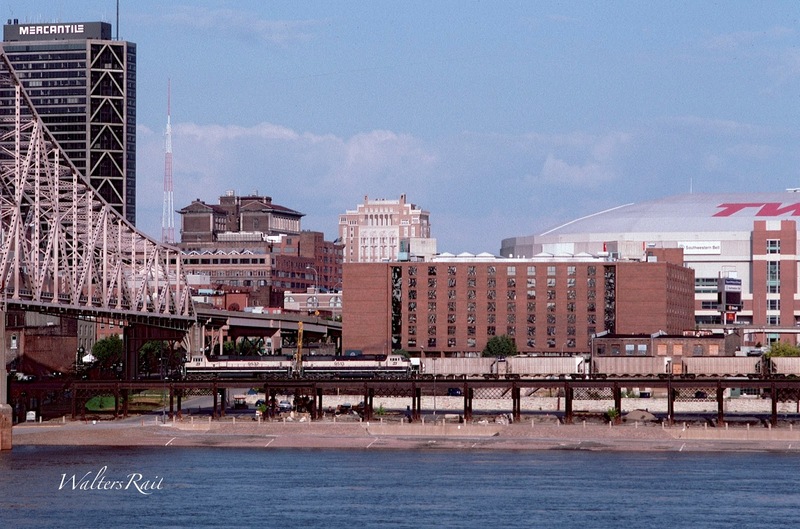 This image was taken during the worst days of flooding on the Mississippi. North of Chester about 30 miles, a few days after this photo was taken, the east side levee breached and water poured into the flood plain. The small village of Valmeyer, as well as the UP tracks running through it, were covered under about twenty feet of water, which did not recede for almost a month. When roads into the valley were finally reopened, I drove to the location of the town to discover almost nothing left. Most of the buildings had floated off their foundations. Looking up, I saw a wooden house chair dangling from telephone lines where it had been snagged during the flooding. A few years later, the village was rebuilt on the bluffs above the river. The image above was taken from the highway bridge crossing the river at Chester, the first bridge south of metropolitan St. Louis, about 60 miles away. The Illinois maximum security state penitentiary is located in Chester, and the UP line runs within about a half mile of it. This area is also notable because here the Illinois border is west of the Mississippi River. The original boundary was fixed before the river course changed during a long-ago flood. The boundary now follows the narrow, curving lake that was left behind after the flood receded and the river relocated about half a mile to the east. 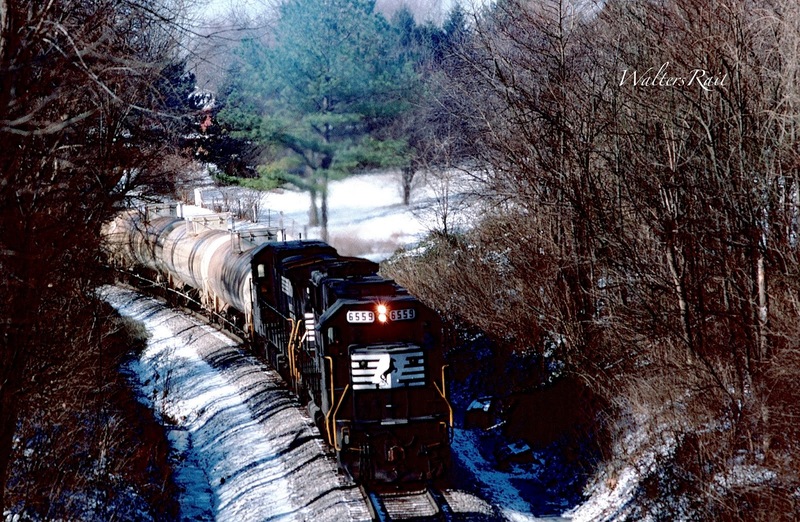 On a brutally cold day in January 1995, Illinois Central 6151 East prepares to cross State Highway 48 about halfway between Freeburg and New Athens, Illinois. New Athens (pronounced with a "long A" to sound like "nations) sits on the banks of the Kaskaskia River, the channel of which was straightened years ago by the Army Corps of Engineers to allow for commercial barge traffic. I visited the area several times and never saw a single barge. I did see many water skiers, however, as the river has become something of a recreational playground in the summer. My family and I considered purchasing a house in New Athens but ultimately decided against it because of the driving distance (about 45 miles) to my office in downtown St. Louis. 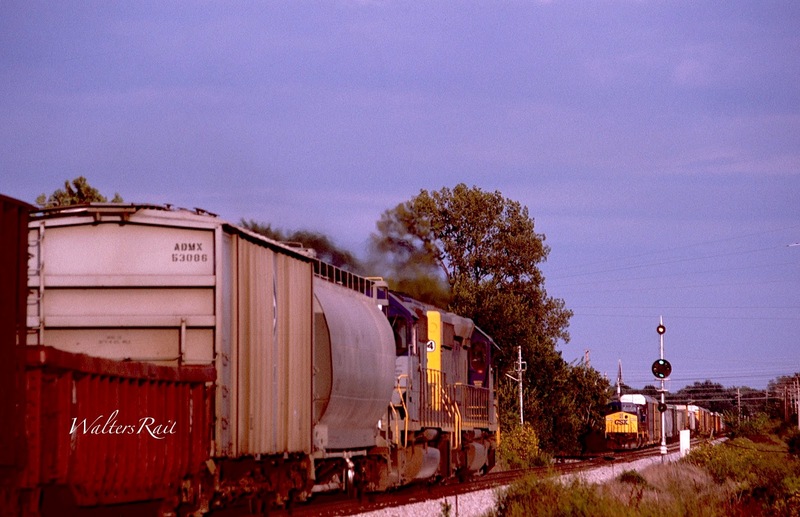 Two CSX freights pass on the Alton and Southern near East St. Louis. The CSX was one of my favorite lines running into St. Louis, because at that time it still employed the old Baltimore and Ohio Color Position Light (CPL) signals, which mimicked semaphore signals by the position of red, yellow and green lights. The image immediately below shows a "stop" signal. If the signal were showing "approach," two yellow lights would appear leaning diagonally to the right. A "clear" signal would show two green lights positioned on the top and the bottom. The small lights above the board indicate that this is a mainline over which the train may pass at maximum speed -- provided one of the small lights is lit. There were a variety of combinations to these signals that I frankly never understood. But I have given you the basics. Trains on the line into St. Louis were dispatched over the radio by track warrant, so finding them required nothing more than listening to my scanner. Traffic was never particularly heavy -- (8-10) trains per day in my limited experience -- but the motive power was almost always clean and shiny. Also, the line ran very close to the Sam's Club in Fairview Heights, Illinois, where I liked to shop for processed foods. I eat much better today, thanks to my wife, but that is another story. 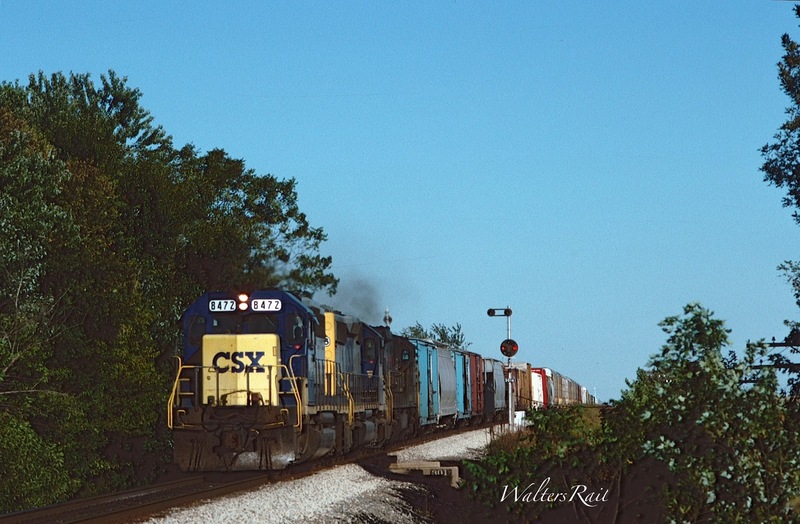 Here is a CSX manifest with a clear board approaching the siding in Aviston, Illinois. 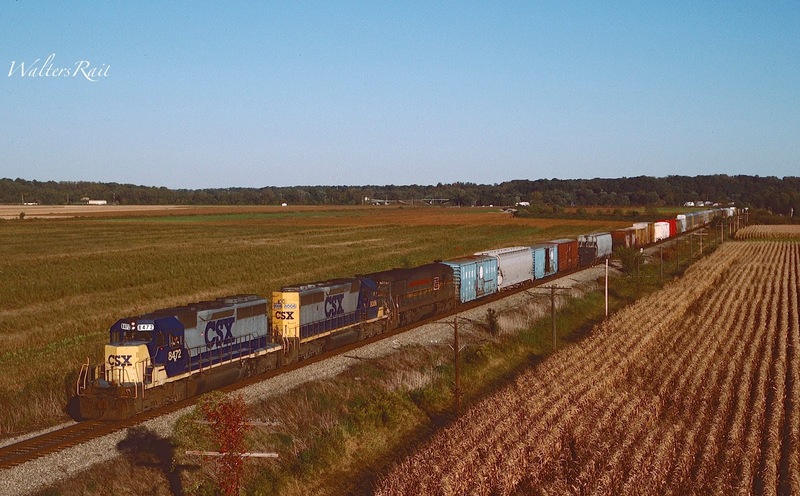 U.S. Highway 50 paralleled the CSX line east out of metropolitan St. Louis, but for the most part, the road was far enough away from the tracks to make chasing difficult. Many areas along the tracks were overgrown with foliage, making photography equally problematic. The time I spent on the line was mostly an exercise in trying to find lighted CPL's. CSX 8472 West has descended into the Mississippi River flood plain, with an old Seaboard System unit bringing up the rear. The flood plain, which can be several miles across, is culturally distinct from the surrounding Illinois and Missouri counties. Proceeding south from St. Louis, one will find houses on stilts and occasional French Plantation homes that have survived from the early 19th century. Because there is no bridge between St. Louis and Chester, Illinois, sixty miles to the south, the river valley carries a sense of extreme isolation, particularly on the Illinois side. Standing in the valley of an early morning, waiting to photograph a train that I have been hearing from many miles away, I feel transported back into another century, one without radio or television or airplanes or automobiles. At any moment, I expect to see a steamboat struggling northward into the muddy current. Mark Twain said: "Unquestionably the discovery of the Mississippi is a datable fact which considerably mellows and modifies the shiny newness of our country, and gives her a most respectable outside-aspect of rustiness and antiquity." That statement is as true today as one hundred fifty years ago. 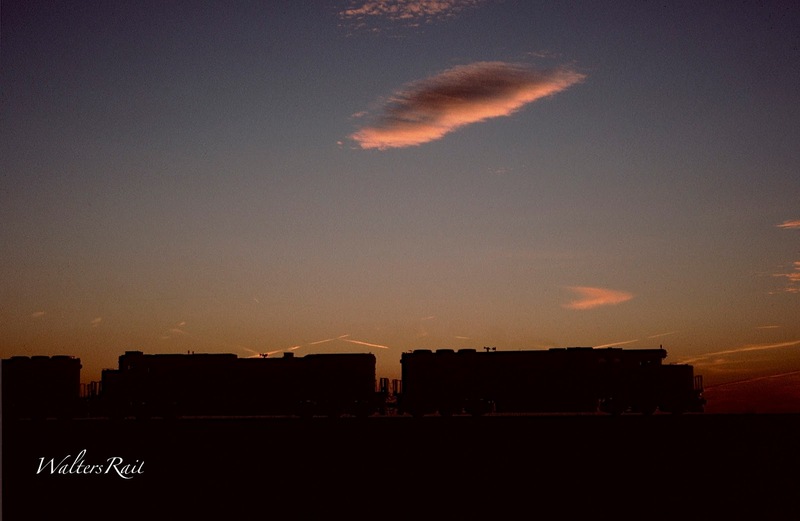 A Norfolk Southern manifest climbs out of the Mississippi River valley after sundown in Bellville, Illinois, which was named by George Blair in 1814. "Belleville" is a combination of two Old French words -- beu, bel "lovely" + ville "settlement", "domain". The town, however, was populated almost exclusively by Germans. In 1870, about 90 percent of Belleville was estimated to be either German born or first generation German American. The Belleville Historic District contains some houses dating back to the early 19th century. 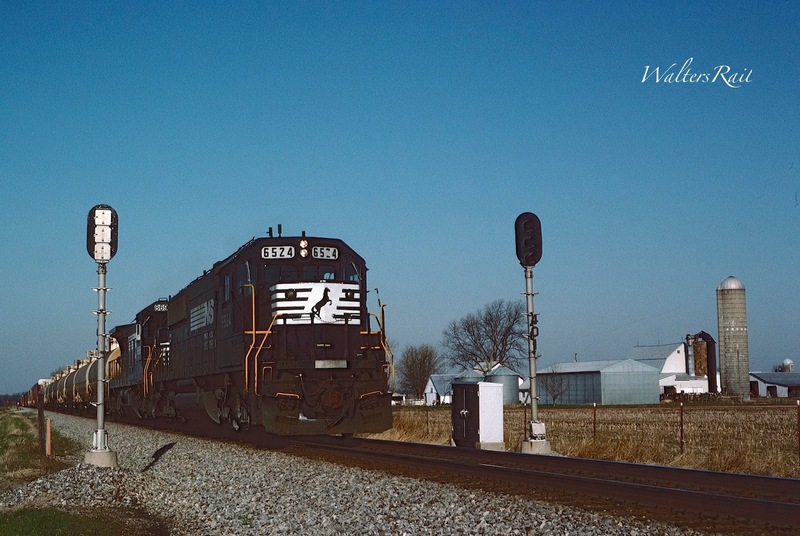 When I lived there in the mid-1990's, both the Norfolk Southern and Illinois Central lines ran through town. 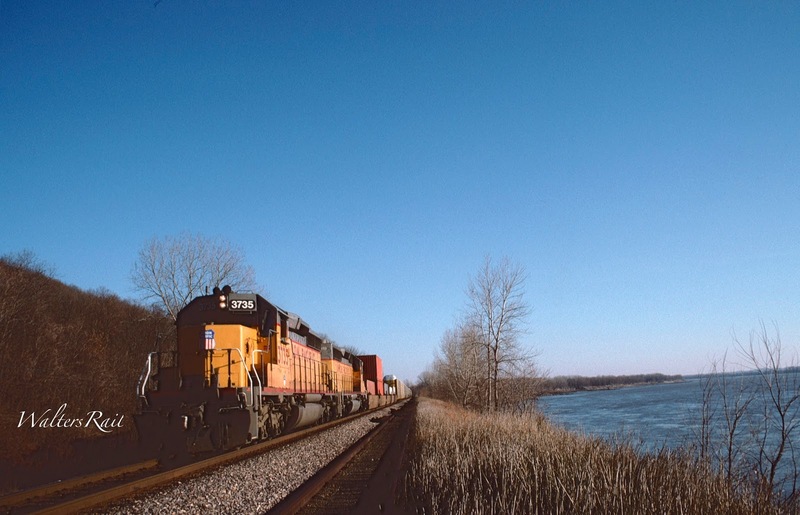 In this image, an eastbound NS manifest is climbing the grade out of the Mississippi River valley. To the left of the NS tracks is the Illinois Central line, other portions of which are shown in photographs above. The Norfolk Southern makes a large horseshoe curve, around the Shrine of Our Lady of the Snows, but the forest obscures the loop. The train is about to pass under Illinois State Highway 15. This was one of my favorite locations, but I never caught an IC train here. I do not know the ruling grade, but Norfolk Southern trains struggled to make the top of the grade. This train was crawling at about ten miles per hour. Though not technically in the Belleville city limits, this location is surrounding by houses. On a cold day in February 1993, another manifest climbs the same grade. Although many railfans do not like the NS paint scheme, I have always been fond of the black stallion. In the time I lived in Belleville, I never saw a filthy NS engine. Also, in those days, the line into St. Louis (originally part of the Southern Railroad) was dispatched by track warrant out of Somerset, Kentucky, a town of about 11,000 south 80 miles from Lexington. When listening on my scanner, I always thought that the dispatchers sounded as though they were sitting in a small office or a large closet. I don't know how many other lines were dispatched from Somerset, but the dispatchers were always loquacious, as though they were bored and wanted someone to talk to. Instead of the curt replies common to dispatchers, these gentleman would often engage in long conversations with the train crews, often discussing sporting events or family matters. The conversations reminded me of a long ago past, when life was slower and human attention spans were longer than a fruit fly's. When I think of central Illinois, I think of this image -- an NS manifest in winter passing a dairy farm surrounded by harvested corn fields. 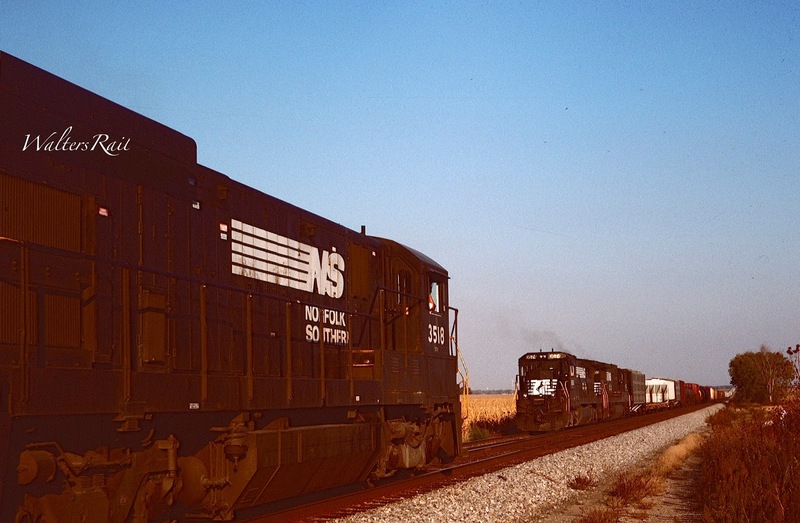 The NS line east of Belleville was paralleled by State Highway 161 all the way to Centralia, where the Norfolk Southern crossed the Illinois Central mainline and also Burlington Northern's Beardstown Subdivision, a major coal hauler in those days. The NS line also passed directly south of Scott Air Force Base. On more than one occasion, I attempted to obtain an image of train and airplane together. I failed. 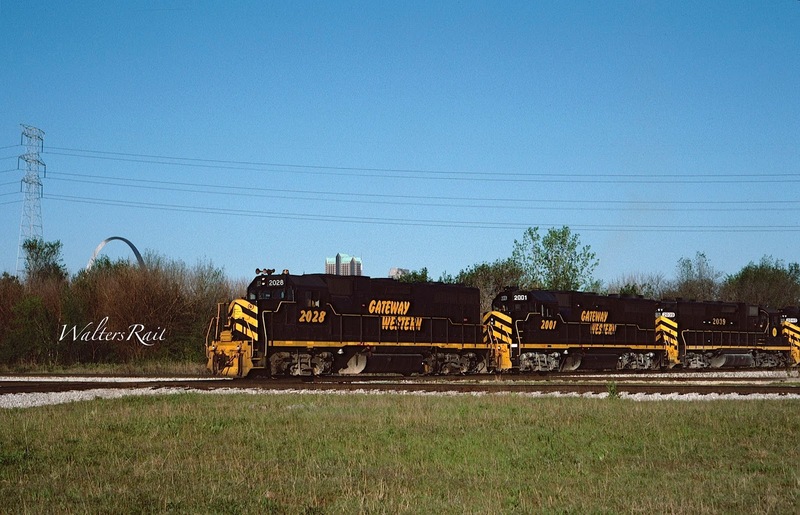 Two NS manifests meet at New Baden, Illinois, in June 1995. The name "New Baden" indicates how thoroughly this portion of Illinois was settled by German immigrants in the 19th century. All the sidings on the NS east to Centralia contained "spring switches." In the image above, NS 3674 West is waiting on the siding for NS 3518 East. Once 3518 has passed, the switch will automatically "spring" back to allow the westbound train to proceed without the necessity of a crewman's throwing the switch. And once 3674 passes, the switch will spring back again to align for the mainline. At the east end of the same siding, the switch has automatically returned to its normal position also to allow the eastbound train to pass without the need of crew intervention. This is the only line on which I have seen spring switches in operation. 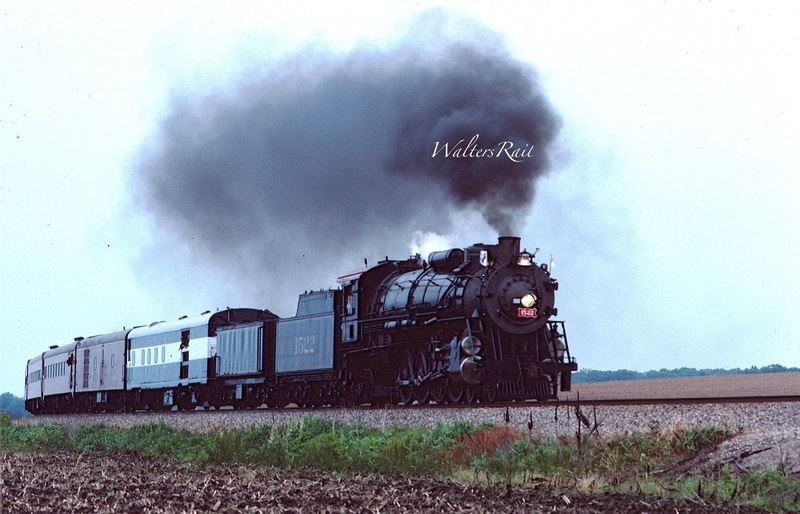 During my years in St. Louis, I was fortunate to see several steam excursions. Here Union Pacific "Challenger" 3985 is rounding the big curve on the Alton and Southern northeast of East St. Louis, Illinois. This train had no diesel back up and roared down the mainline to Chicago at 80 miles per hour -- one of the most spectacular sites I have ever witnessed. My friend Dale Jacobson was visiting at this time, and we chased this train several miles north. This was the best image I captured. My most vivid image is of the Challenger racing through Illinois corn fields at 80 miles per hour, with the gigantic drive wheels turning what seemed much too slowly for such fantastic speed. I later changed my opinion when I realized that the drive wheels were significantly taller than I am. On another occasion, here is the Challenger climbing Kirkwood Hill west of St. Louis. This image was taken at sunset of an overcast and hazy summer day -- not unusual in the St. Louis area. Again, there was no diesel back up power for the train, and the Challenger was really struggling up the hill. From my vantage point, I could both see and feel each reciprocation of the steam cylinders, as though with each cycle, someone were shaking me by the shoulder. The power of the engine was overwhelming. On another overcast summer day, restored Frisco 1552 made a fan-trip run from St. Louis Union Station to Centralia, Illinois, and back. I took a few images of the train in each direction, and this is the best one, which gives you some idea of the weather. One nice thing about steam locomotives is the smoke plume, which can produce a reasonably dramatic effect even on the dreariest of afternoons. On this particular day, I mostly remember the incredible line of automobiles chasing 1522 along the state highway, like an overflowing river of refugees trying to escape the Wehrmacht. Vehicles were driving crazily, some with small children aboard, so I tried to stay as far away from the crowd as possible. I have never chased another steam locomotive. An eastbound Union Pacific manifest prepares to cross the MacArthur Bridge in downtown St. Louis. The image was taken through the window of my office. Whenever the practice of law grew boring, which it did from time to time, like all jobs, I would sit at my desk and count trains. It was not unusual for four or five trains to cross the bridge per hour. If I had a decent shot of the bridge, I would post it. But I don't. The bridge was surrounded by poles, wires and heavy industry, and I could never see a way to get close enough for an image. I suspect others have done so, but not me. So this will have to do. 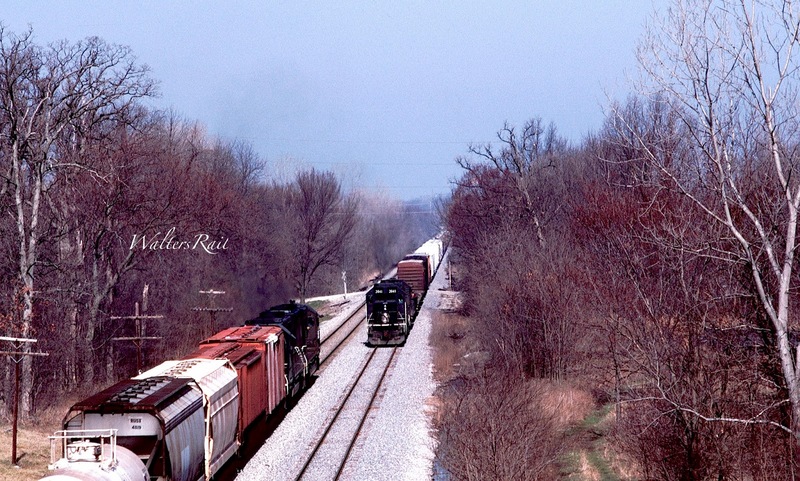 Two Illinois Central freights meet south of New Athens, Illinois, in February 1993. This line ran southeast out of East St. Louis to its junction with the mainline at Dequoin. Illinois State Highway 13 followed the line closely to Pinckneyville, making chasing easy. We all have regrets, and I wish I had spent more time on this line. Traffic was sporadic, however. Seeing two trains in the daylight, as in this image, was a treat. The photographer is standing on the Highway 13 overpass. 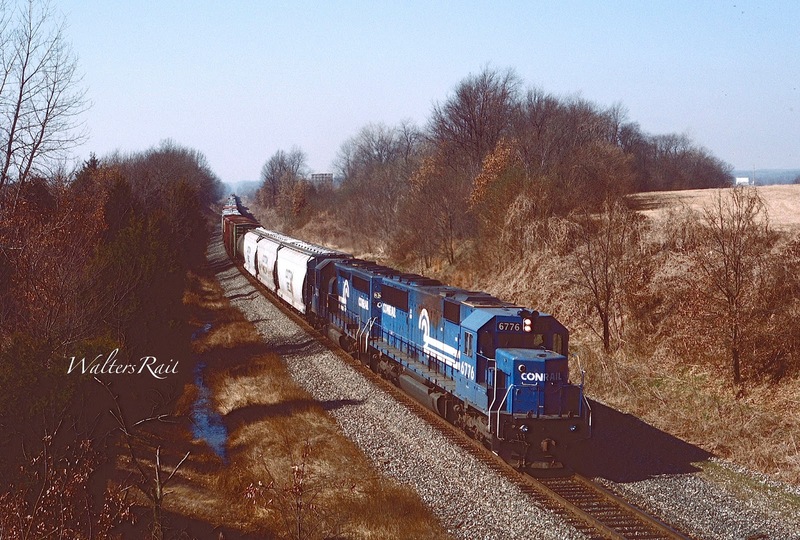 Conrail 6776 East is climbing out of the Mississippi River valley near Collinsville, Illinois. This was the old Pennsylvania Railroad mainline running southwest from Indianapolis. As the image shows, the line was once double-track but was reduced to single-track CTC when I lived in the area. Conrail ran many trains in and out of St. Louis. The motive power was clean. This particular line was difficult to reach from my house, and I did not spend much time along it. I naively assumed that Conrail would be around a long time. 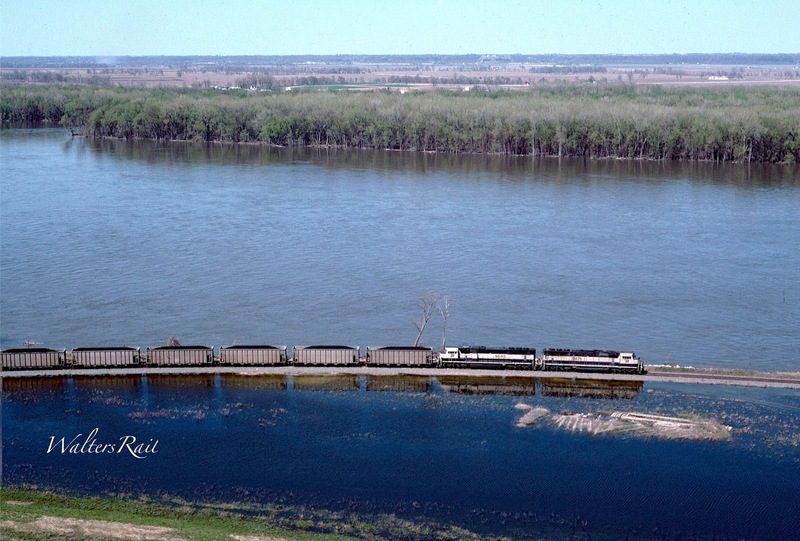 The image below was taken along the double-track mainline running on the east bank of the Mississippi River from Dupo, Illnois, to Thebes, where the line crossed the river and split into two single track lines. Originally, the double-track line saw both Missouri Pacific and St. Louis and Southwestern (Cotton Belt) trains. Where the lines split after crossing the river, each railroad operated one track, more or less paralleling each other across southwest Missouri and Arkansas. When I first arrived in St. Louis, the Union Pacific (successor to the MP) and the Southern Pacific (owner of the Cotton Belt) ran trains in and out of Dupo. In a few years, UP swallowed SP, and the line belonged to a single railroad. This was my favorite line in the St. Louis area. Traffic was usually very heavy, and the scenery was excellent along the eastern bluffs of the Mississippi River. Here a northbound Union Pacific freight is speeding past Valmeyer, Illinois. As discussed above, a few years after this image was taken, Valmeyer and the UP tracks were under about twenty feet of water. I spent one October afternoon photographing trains along this "joint" line. 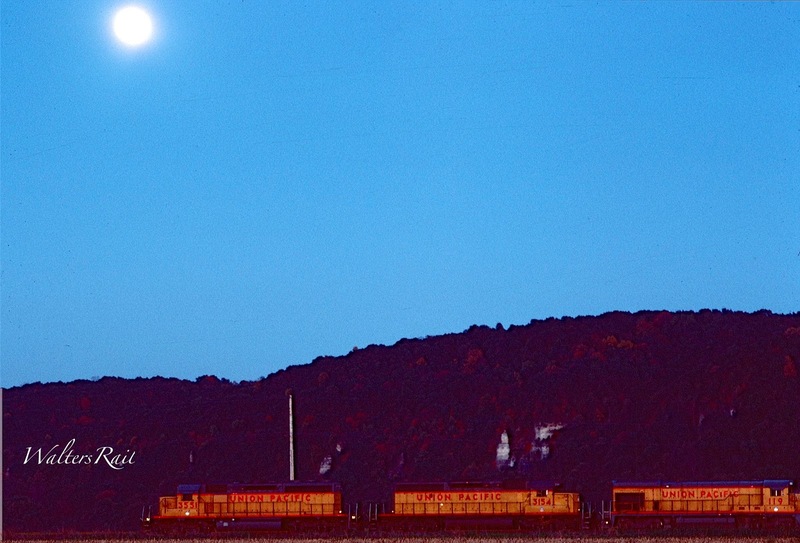 After the sun went down, I was driving back to Belleville when I saw a northbound freight stopped on the mainline with a full moon rising above it. I took this image, illuminated solely by moonlight. Some of the fall foliage emerges through the darkness on the bluffs. When I look at this image, I feel that I am either dreaming or inebriated. Fog along the Mississippi River is common, especially in winter. My office was on the 31st floor, and I can remember many mornings in January and February when I would look out my window and see nothing below but white fog blanketing the river and downtown St. Louis. Above was clear blue sky. This image gives a similar effect. The photographer is standing on tall bluffs above the flood plain. In the background, the river is shrouded in fog, though you can see the Missouri bluffs rising slightly above. Traces of fog also linger in the foreground above the UP train, and the fallow fields look a little like the swamp they were before being drained in the early twentieth century. 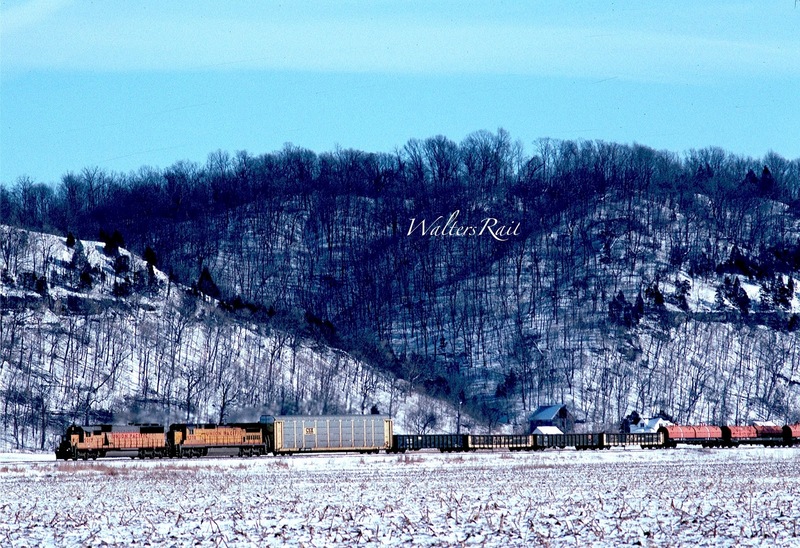 A Union Pacific merchandise train rolls north in January 1995 beneath Illinois bluffs above the Mississippi River. This image was taken from one of the county roads that parallel the tracks through the valley, which is often called the American Bottoms and extends from Alton, Illinois (north of St. Louis) to the Kaskaskia River (north of Chester). Levees and drainage canals generally protect this wide plain from flooding, though as discussed above, in 1993 the levee broke in several places and inundated the area with twenty-plus feet of water. The flood plain is bounded on the east by a nearly continuous, 200–300 foot high bluff of limestone and dolomite, above which begins the prairie that covers most of Illinois. The Mississippi River runs directly beneath the bluffs on the Missouri side. Union Pacific and Chicago and Northwestern power lead a southbound intermodal train beneath the bluffs of the American Bottoms. The cliffs are so sheer and heavily wooded that climbing was impossible for me -- a 45 year old man without any training, when this image was taken. In theory, it would be possible to approach these cliffs from the prairie highland side. However, one would be required to trespass long distances over open corn and soy bean fields, because there are no public roads near the precipice. A few local roads run down into the valley from above, but those are narrow, curving and blanketed with trees. I only found a few spots where I could look down into the valley from the high ground. 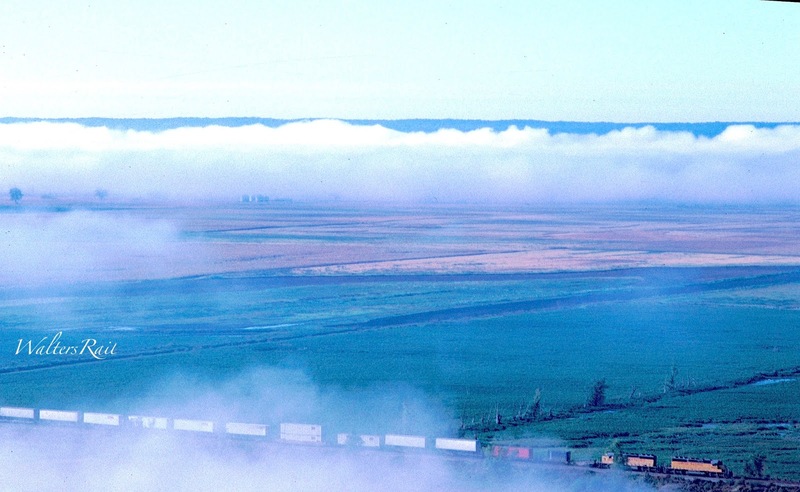 The image of the UP train in fog was taken from one such location. 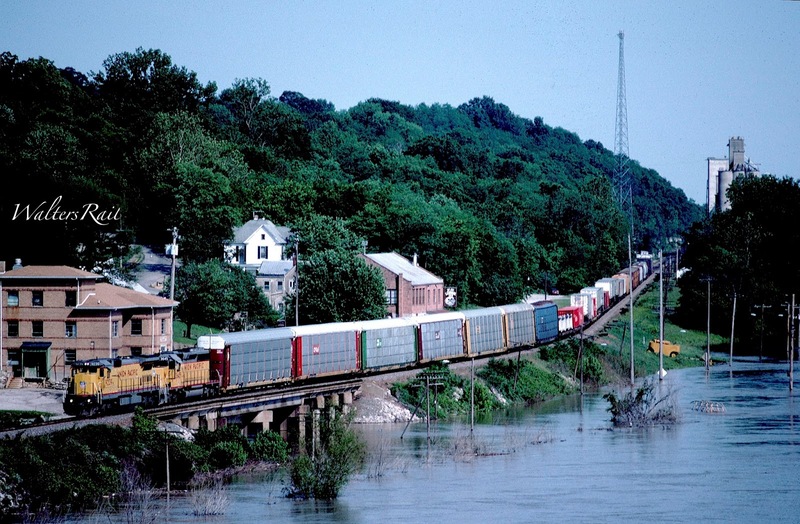 Here a UP freight is heading north along the Mississippi River south of Chester, Illinois, where the river runs for a short distance near the Illinois bluffs. When this image was taken, the second track was out of service. The line was effectively single track through Chester. The river was about a half-mile wide. The far bank was, and still is, part of Illinois -- another location where, after the boundary was established, the river changed course, leaving a portion of Illinois to its west. 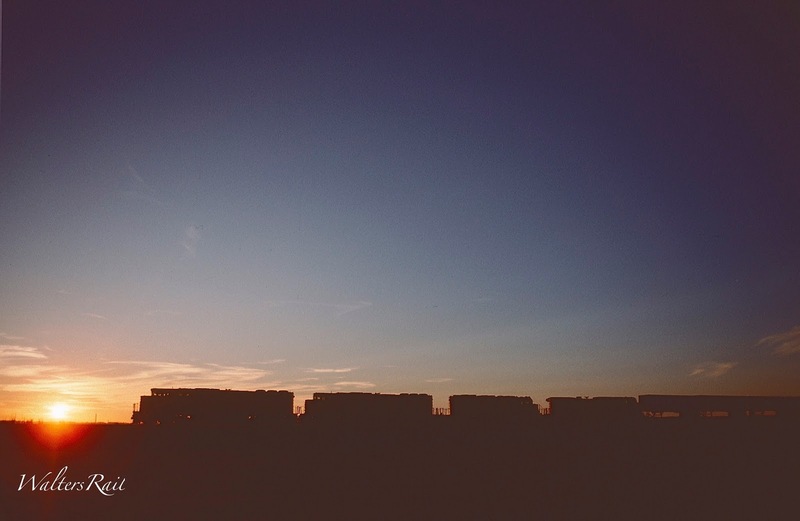 A southbound Union Pacific trailer train near Gorham, Illinois, races the setting sun toward Missouri. Gorham is where the Union Pacific line from Chicago ties into the line from St. Louis. Traffic south of Gorham can be spectacularly heavy. When I lived in this area, this extremely busy line narrowed to a single track where it crossed the Big Muddy River, often causing multiple trains to stack up in both directions. I have not been back to Gorham in 20 years, but the current Google Maps image (as of January 5, 2017) shows what appears to be construction crews along the river, as though UP may be constructing a second bridge. The Google Maps coordinates are 37.576249, -89.456130. 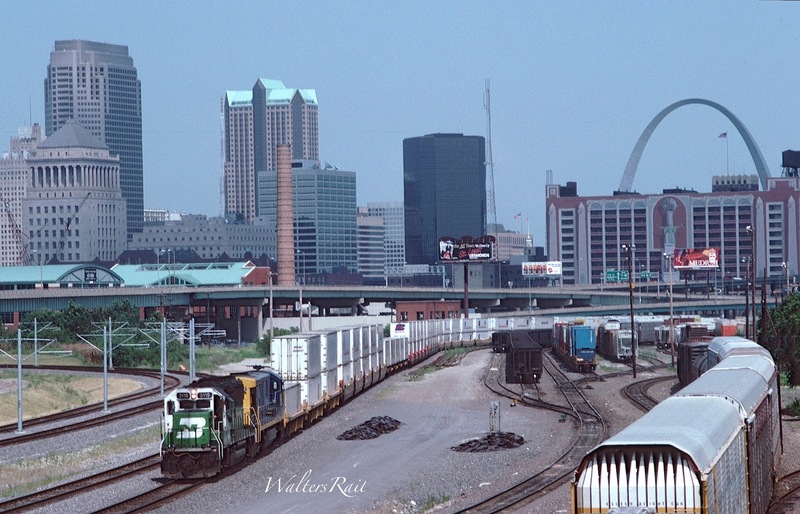 Burlington Northern and CSX power lead a BN stack train west past downtown St. Louis in July 1993. Immediately to the left of the train are the tracks of the new St. Louis MetroLink light rail system, which would start operations about two weeks after this image was taken. Above the MetroLink tracks is St. Louis Union Station. 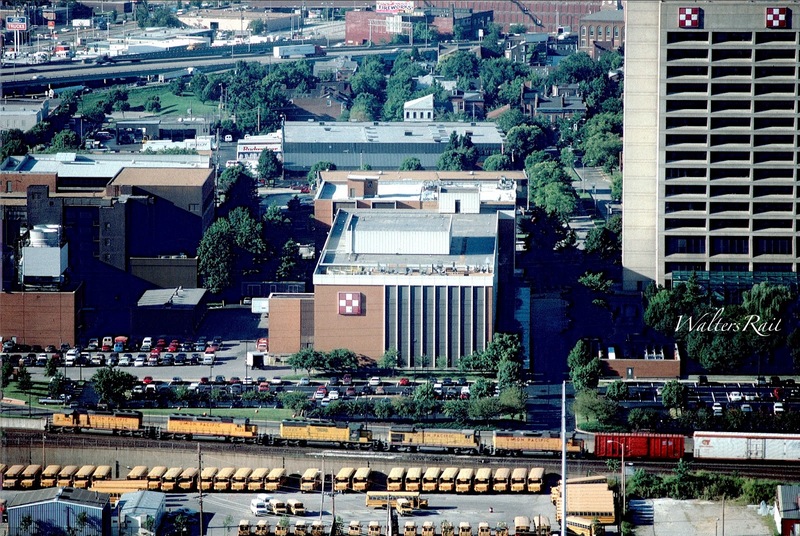 Above Union Station stands the tallest building in the picture and the headquarters of what was called at that time SBC Corporation, one of the so-called "Baby Bells." SBC was the holding company for Southwestern Bell Telephone, the smallest Baby Bell, with service territories in Texas, Oklahoma, Arkansas, Kansas and Missouri. I worked on the 31st floor of that building. Eventually, after a series of mind-boggling acquisitions, SBC changed its name to AT&T Corp. (In the last acquisition, SBC purchased AT&T. In other words, the mouse swallowed the tiger.) Today, I am a private attorney representing AT&T. 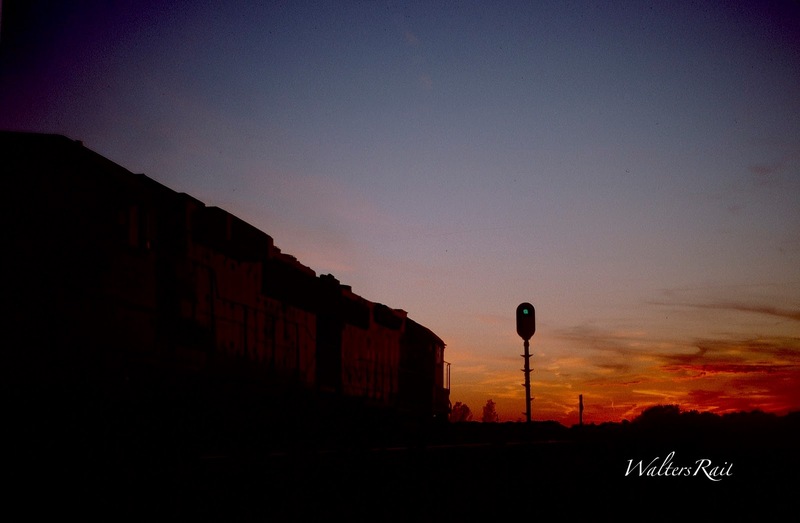 An eastbound BN freight passes a new MetroLink maintenance facility as the sun sets on St. Louis and this post. I very much enjoyed my years in St. Louis. The railroad action was great, and the town still bore the marks of the French who plied the muddy waters of the Mississippi so many years ago. 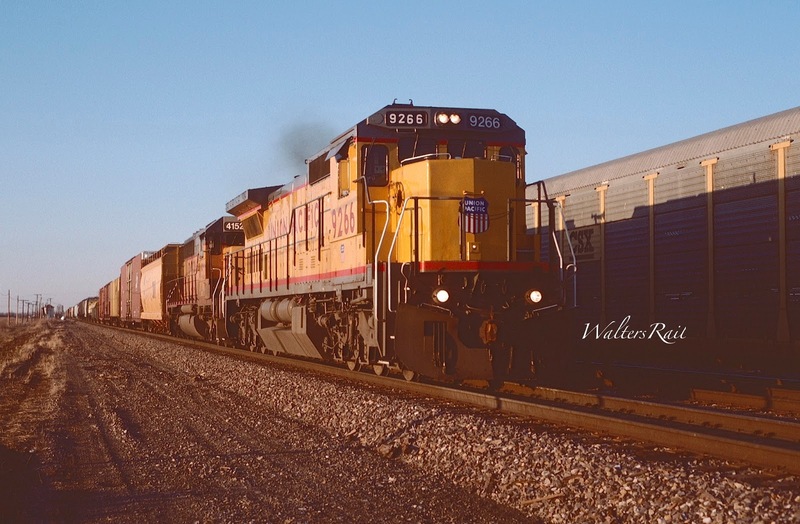 To see all of my posts, go to waltersrail.com.